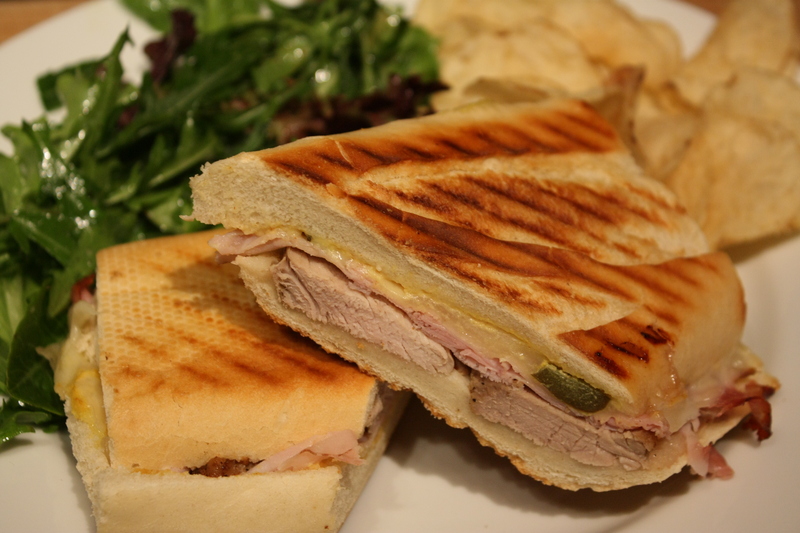 A Cuban sandwich, if you don’t know, is a toasted sandwich containing a layer each of pork, ham, Swiss cheese, and pickles; topped with mustard; and made on French bread. It takes a little more work than most sandwiches – think of it as complicated grilled-cheese – but it’s worth the effort. It’s fun to make because each layer is so different, which creates a great mix of flavors and textures. You’ll want to start with a loaf of crusty French bread. 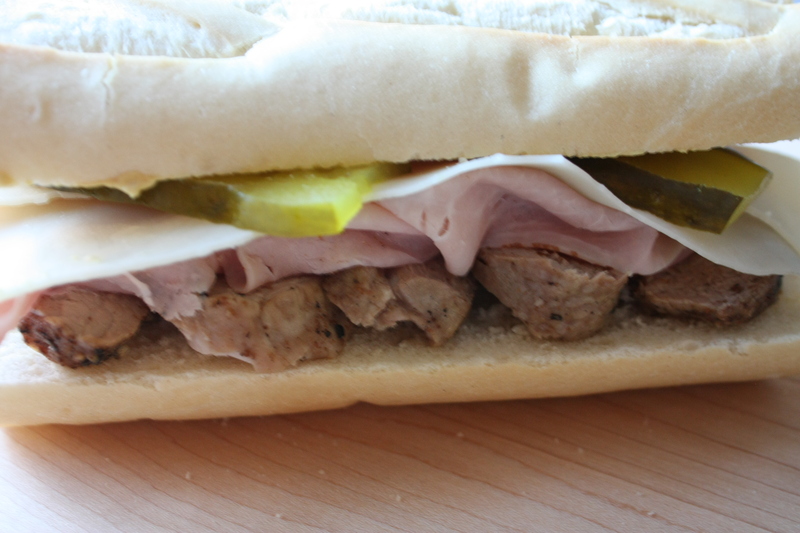 Using not just good bread, but the right bread, is the key to a great sandwich. (Try imaging what it would be like to eat, say, peanut butter and jelly on rye or roast beef on cinnamon raisin and you’ll see what I mean!) 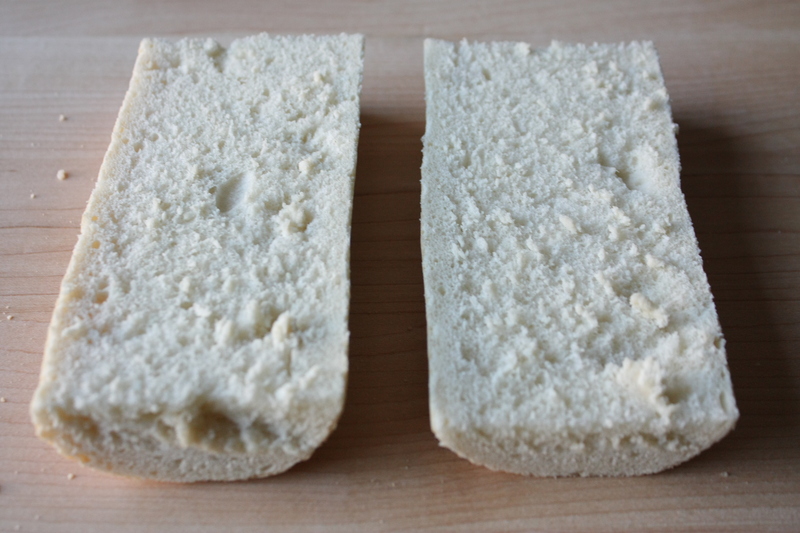 Cut two, six- to eight-inch pieces from the middle of the loaf – using the ends will make it a little bit harder to flatten the Cuban later – and split each piece open. The picture below is of the two bottom halves. Start with a layer of the chili-glazed pork. 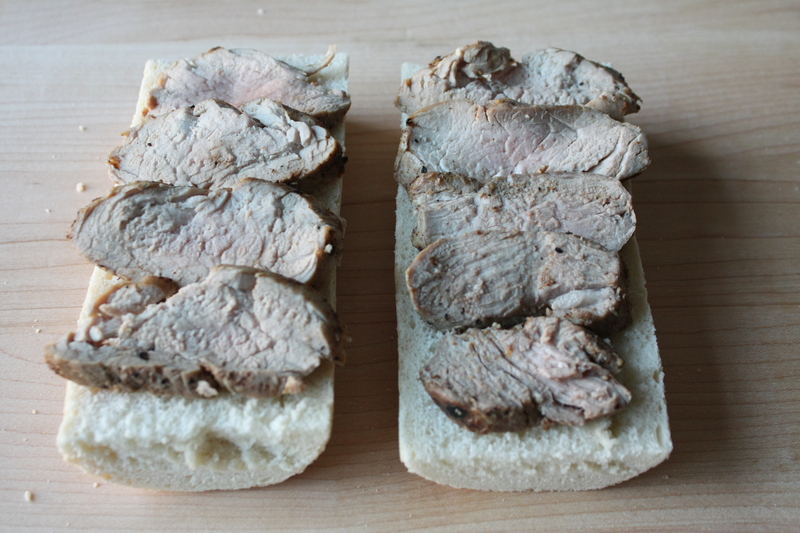 A traditional Cuban calls for shredded pork, but I’ve used slices (like in the photo below) and it’s worked just fine. I’ve also cut the slices into strips and even diced them up, but in the end, it wasn’t worth the extra effort. Next comes the ham. Any kind will do (I just used boiled ham), but make sure it’s sliced thin. 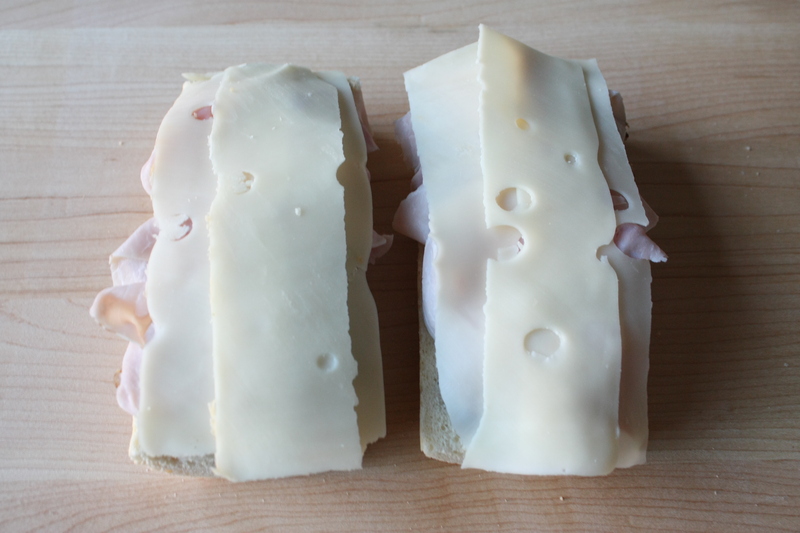 I used two to three slices per sandwich and piled them up as you can see below. The next layer is Swiss cheese. I like to slice the cheese in half lengthwise so I can make sure it doesn’t hang too far over the edge of the bread. (The picture below shows one half piece on top of two slightly overlapping half pieces.) Remember, you’ll be toasting the sandwiches, so the more cheese hangs out, the more clean up you’ll probably have to do. Next are pickles. I like to use the longer, flat sandwich slices, because they’re so easy to work with, but you can use round slices too. 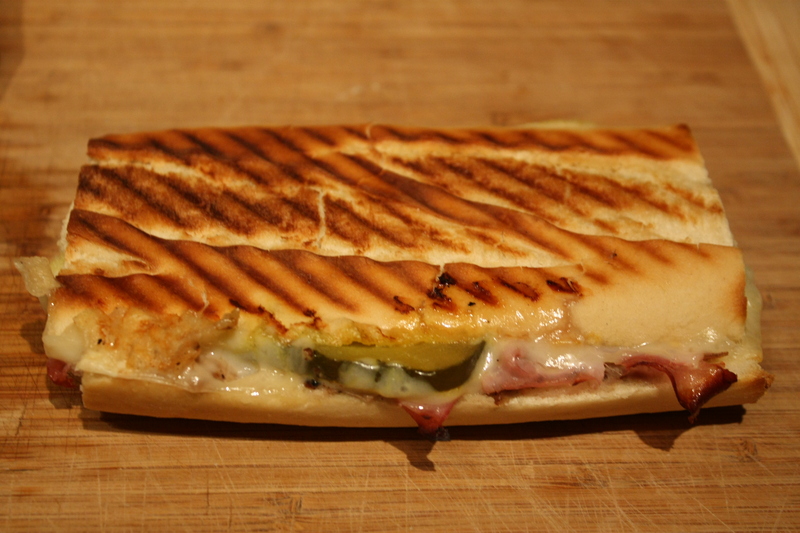 I’ve made these sandwiches using homemade bread and butter pickles, which are sweet and give the Cuban a very different, but equally awesome, taste. (Check back in over the summer and I’ll share my favorite pickle recipes!) 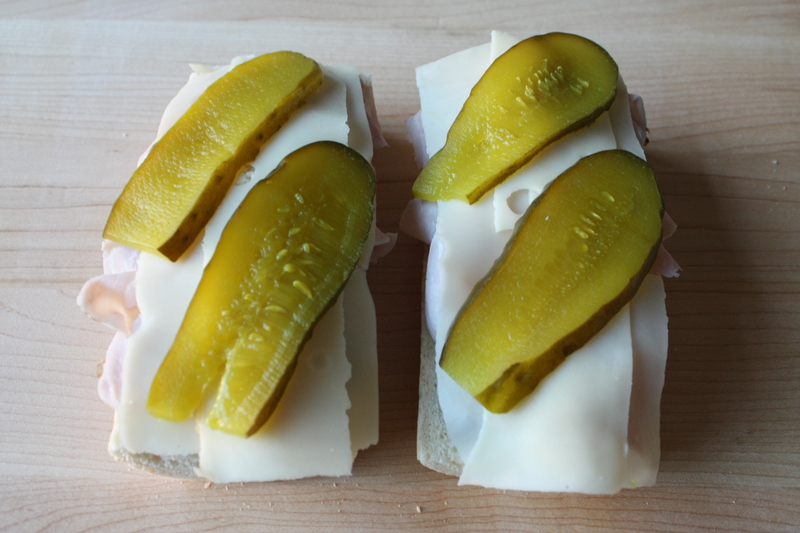 Lay the pickles diagonally across the sandwich so you can get a little in every bite. Before you toast the sandwiches on the grill, press them flat a bit – don’t get too carried away, or the Cuban may slide apart! 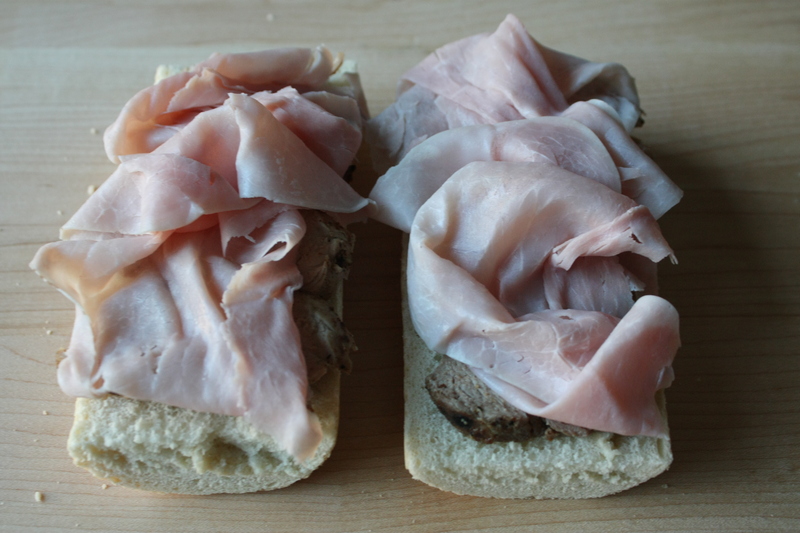 – and the brush the top and bottom of each sandwich lightly with olive oil. Now you’re ready to toast. We use a cast-iron grill pan for this step, but you can use a frying pan. Turn the heat to medium low and place the Cubans on the grill. 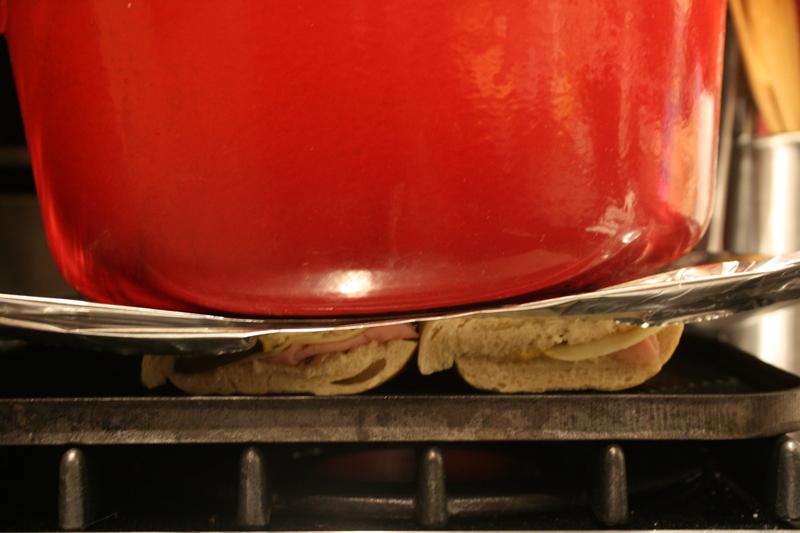 You’ll want to put something heavy on top of the sandwiches to help keep them flat; we use a large Dutch oven (it’s actually a small Dutch oven inside of a larger one), but anything heavy and non-flammable will do. I usually cover the sandwiches with aluminum foil before putting the weight on top. This has nothing to do with the cooking process; I just do it so I don’t have to clean the bottom of the Dutch oven. We served this with a small green salad and salt-and-vinegar potato chips. A nice, cold bottle of very hoppy IPA was the perfect complement.